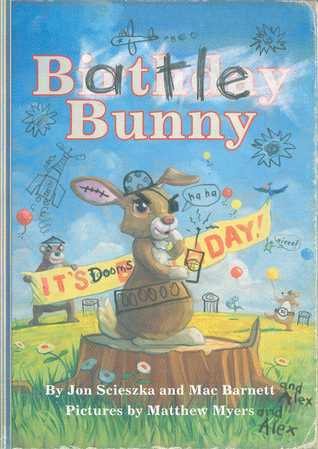 While Battle Bunny would be a difficult book to read aloud to a class in its entirety, it is certainly worth talking about and is one of those books that will get passed around from hand to hand, spending very little time on the book shelf. Despite the subversive nature of the story, it is really quite creative and complex in its structure, causing readers to have to strategize about how to unpack the text. Even I struggled with how to go about reading the book at first, eventually deciding to read Alex's defacings in my initial read-through, completely ignoring the original story, and then going through a second time to see what was actually in the original Birthday Bunny story. So in this way, Battle Bunny is a wonderful book to use to talk to students about reading strategies. But beyond reading strategy and lesson planning, this book is just plain fun. I mean, who hasn't wanted to deface a book you've found incredibly dull and trite? (I admit to cutting up a copy of T.S. Eliot's "The Waste Land" and creating a found poem as my own act of subversive frustration.) I am now tempted to buy up all those Little Golden Books I find at my library's used book store for such an activity. But in case you can't find your own Little Golden Books or the idea of defacing a real book, no matter how trite, feels blasphemous, you can go on the My Birthday Bunny website and print out the original version of the story and create your own act of defacement. There's even a Tumblr page where other author/illustrator versions have been posted.